The jig, as they say, is up. Specifically, Vancouver emo poppers Marianas Trench have boldly divulged the secrets of its craft with “Pop 101,” a song that gives listeners some inside intel on how exactly assembly-line, ringtone-friendly Top 40 music is made. With 14 years in the game, four albums (including this year’s Astoria), and innumerable awards and nominations in its homeland, Marianas Trench definitely knows of which it speaks. Certainly, pop music has followed trends and formulas for generations, but it has never been as ruthlessly calculated, thoroughly polished, and mathematically perfected as it is now. But what, specifically, is the recipe? “Pop 101” lays it all out: “Now let’s start with verse one / A minor chord, tensions grow / Fade in the bass like so / Now with momentum go / Stop / And bring the beat back.” No cliché is ignored. “The bridge is the part when you bring in a rapper friend,” the song helpfully explains. “You simplify and slow the beat / Abbreviate ‘feature’ to ‘feat.’” For the record, the song’s obligatory hip-hop verse is supplied by Anami Vice. 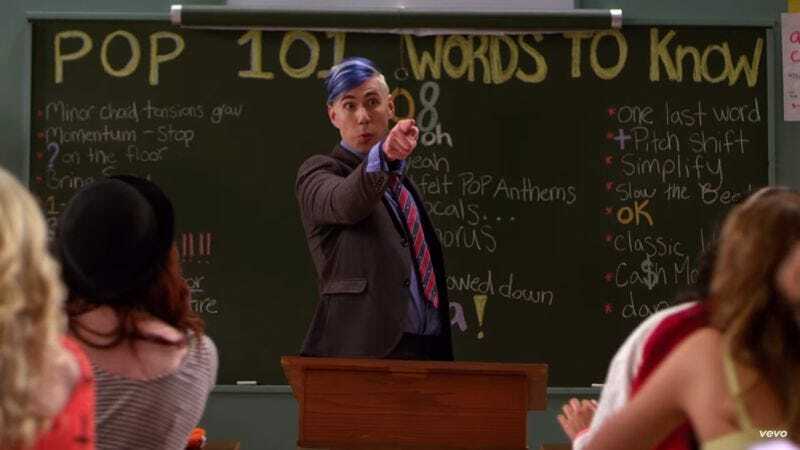 Naturally, the accompanying video for “Pop 101” has even more fun with the conventions of the genre, with Marianas Trench lead signer Josh Ramsay giving his students a master class in pop craftsmanship. The clip itself playfully references such YouTube favorites as “Blurred Lines” by Robin Thicke and “Fancy” by Iggy Azalea. And, yes, since Azalea’s video was already referencing the movie Clueless, this is officially a parody within a parody. It’s a matryoshka doll of pop culture quotation.